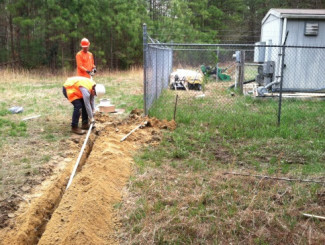 ONE performs monitoring and remediation services at a National Priorities List (NPL) site located in Virginia. The site entered into the Superfund program in accordance with the Comprehensive Environmental Response, Compensation, and Liability Act of 1980 (CERCLA) as a result of a historical release of hazardous substances. Collection and disposal of used solvents occurred during the 1960’s and early 1970’s as chemical wastes were emptied and ignited in one of two unlined burn pits onsite. While the source waste was removed and impacted soils excavated, a contaminated groundwater plume exists within the vicinity of the historical burn pit and an active dual-phase treatment system for groundwater was in operation during the early stages of remediation. Cleanup and monitoring activities at the site are conducted in accordance with the Record of Decision (ROD) developed for the site in the 1990s. Although greatly reduced from initial levels as a result of prior remedial activities, a mixed groundwater plume is present containing both chlorinated volatile organic compounds (CVOCs) and petroleum-based compounds at levels above federal drinking water standards. The highest concentration of contaminants tends to occur in wells within an isolated bermed area and corresponding to the historical burn pit, while wells outside of the bermed area are either non-detect or show minor detections for CVOCs. The mixed plume has resulted in minor enhancements to natural attenuation processes of CVOCs. However, these enhancements have not resulted in decreasing trends acceptable for transitioning the site into a MNA program. Consequently, the project team proposed an innovative pilot bioremediation program to further enhance natural attenuation processes in two residual source areas which continue to exceed groundwater standards. 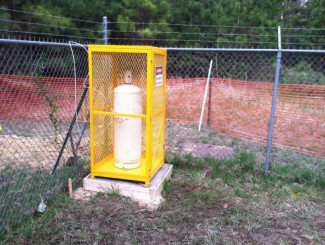 This innovative treatment program involves the introduction of dissolved oxygen gas and dissolved propane gas into the groundwater plume at two separate locations. The pilot project was approved by the Region III of the United States Protection Agency (USEPA) in early 2014, and ONE has since installed, implemented, and now manages the pilot bioremediation system. Performance monitoring data collected to date indicates that the pilot project is successful in reducing levels of BTEX constituents and CVOCs. ONE has implemented a comprehensive groundwater monitoring program at the site. This program was designed to monitor plume conditions and evaluate natural attenuation conditions in an effort to support lines of evidence that MNA as a long-term remedy is acceptable. 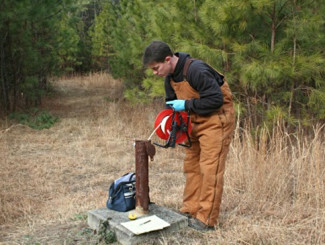 Groundwater monitoring is performed in accordance with the site-specific Sampling & Analysis Plan (SAP) consisting of low-flow sampling procedures for a wide range of constituents including VOCs, semi-volatile organic compounds (SVOCs), metals, nutrients, dissolved gases, microbial counts, anions, and physical parameters via field test kits. The microbial samples analyzed for functional genes to determine the presence and abundance of appropriate bacteria capable of carrying out in situ dechlorination. Quality assurance and quality control (QA/QC) samples are collected to ensure sample integrity and to confirm laboratory precision and accuracy. ONE performs all data assimilation, data validation, and data evaluation services required for the project, which includes assessing MNA conditions, plume stability, and remedial performance. These reports are submitted directly to the USEPA and the Virginia Department of Environmental Quality (VDEQ).